Founded by Umbri in the land of Esino valley, Jesi subsequently was conquered by Etruscans and by Senonian Gauls, native of France and arrived in the peninsula in the V sec. a.C., who had in Senigallia their capital. The date of 295 a.C marks the end of the autonomy of the italic populations, that after the Sentino battle passed under the jurisdiction of Rome. Jesi therefore became municipium romanum and aquired the town planning still visible today (medieval walls in fact were built along the perimeter of Roman roads). After the end of the Empire the city was witness, like other localities of the region, of pillages and destructions operated by invading people, of the fight between Ostrogoths and Byzantines and the reduction of Charlemagne, which determined the end of the Longobard Reign in Italy. Between the VIII and X century had great relief the presence and the work of Benedictines monks who constructed abbeys in the territory of Marches. In 999 the Emperor Ottone III gave back Jesi to the dominion of the Church. 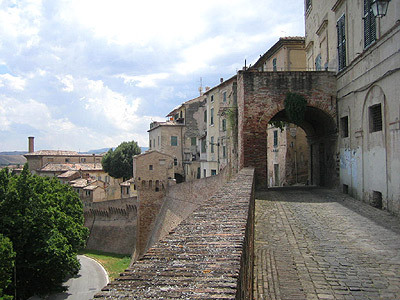 In the 1130 Jesi became free Comune knowing a period of trading and architectonic development with the construction of the most important monuments of the city and the fortification of the medieval village. In 1194 Jesi gave birth to a unique actor in the political and historical panorama of the age: the Emperor Federico II of Svevia, said Stupor Mundi. As for other cities ideals of the age of the Comuni failed and followed the powerful noble families: Malatesta, Braccio da Montone and Sforza, who gave it to the Church in 1447 that kept it until 1797, year of entrance of the napoleoniche troops in city. In 1808 was annexed to the Reign of Naples and remained until September 1860, day in which Italian army entered to Jesi annexing it to the new Reign of Italy. Jesi has a lot of art pearls and still conserves its medieval aspect surrounded by high walls along which stands out the Montirozzo Tower ('400), symbol of the city: the Chatedral of San Settimio (XII-XIV sec.) and the gothic church of Saint Mark ('200), the Palaces of the Podestà and Comune (the XII sec. ), the Palazzo della Signoria of later age (half through the '400) an Rococò mastepieces like Palazzo Pianetti (half through the '700) that today it accommodates the Municipal Museum (Pinacoteca) that keeps mastepieces by Venetian painter Lorenzo Lotto, than worked here in the second half of '400.